This is why I feel fairly confident in saying I have absolutely no aspirations of ever writing a novel: Because I would want it to be like this book; and it never would. It's difficult to say why I even liked it so much. 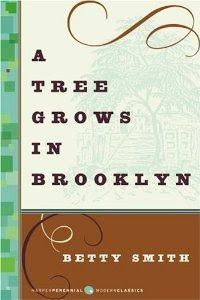 Anna Quindlen said, "A Tree Grows in Brooklyn is not the sort of book that can be reduced to its plot line. The best anyone can say is that it is a story about what it means to be human." So you could say that it doesn't have a gripping plot...except that for me, human nature is gripping, and far more so than dragons or vampires or zombies. Then there's the writing, which, in a word, is exquisite, but not in an extravagant, flamboyant way, but as something so simple and realistic that I literally thought I could taste Katie's made-over bread and feel the pencil groove in Francie's desk. It was tactile and tangible; it's the way I wish I could write. Johnny: okay, yes, he was kind of a bum father, but what a kindhearted, gentle, devoted bum father he was! Maybe I'm just comparing him to Rex Walls from A Glass Castle, but I thought Johnny was (almost) everything Francie needed him to be. Sure, providing clothes and food would have been nice, but really, Francie had a strong enough work ethic that she could provide those things for herself. What she really needed was someone to love her, praise her, and need her, and Johnny did all of those things. Katie: In my opinion, Katie was the most complicated character in the book. It would have been so easy to paint her as mean and cruel or, on the flip side, warm and nurturing, but neither would have been as believable as what Katie was: strong-willed but vulnerable, knowing she loved Neeley best but not wanting Francie to know it, having her own dreams but sacrificing them for her family, hard on the outside but with a soft spot here and there. Neeley: It took me a good chunk of the book to decide if I was going to like Neeley or not. There wasn't anything to dislike about him in the first chapters, but she kept hinting at "his gang" or drinking and smoking, and I was just so afraid he was going to turn into a real punk of a brother. Thankfully he didn't, and I think my favorite scene with Neeley was when he was in a hurry, and Francie offered to iron his shirt. There was an identical scene (parts of the conversation were even word-for-word the same) with Johnny and Francie. Sissy: In what other book can you find such a promiscuous character who is as lovable as Sissy? I mean, really. Francie: And then, of course, Francie, who was the perfect heroine...so easy to love and hurt for. She was lonely and never had a best friend (which, in some ways, was so refreshing since sometimes best friends are annoyingly attentive and supportive with no real character of their own). I loved Francie as much as I've ever loved any of my favorite heroines. There was only one part of the story that really irritated me, and that was Katie's conversation with Francie after Lee has been exposed as a total jerk. I didn't agree with Katie's assessment of "first love." Disagree with me if you will, but I'm grateful I didn't waste even a kiss on my 16-year-old crush. Aside from that, I loved the book. If I could visit 1916 Brooklyn, I think I could find my way around although I think I'd be a bit terrified since I'm not made of the same kind of steel. If you're somewhat intimidated by classics, then this is the perfect one to try. Since it's not as classically classical, it is very readable with many touching moments (my favorite being the flowers after graduation). In my eyes, this was a near-perfect novel.